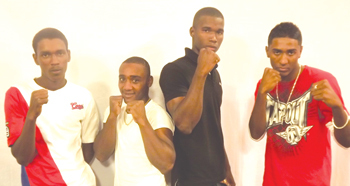 Guyanese Boxing fans will be in for a treat when several local amateur boxers go head to head against their counterparts from Trinidad and Tobago tonight when the 26th edition of Fight Night Guyana gets underway at the Cliff Anderson Sports Hall from 08:00 hours. Speaking at yesterday’s press conference at NCN studio, President of the Guyana Amateur Boxing Association, Steve Ninvalle welcomed the Trinidadians and said the locals are well prepared for their fights. He informed that this is part of a four year developmental plan. He stated that they are currently speaking to officials from Barbados and Jamaica for similar cards to be held. President of the Guyana Boxing Board of Control Peter Abdool said this card will give an indication of where the fighters are in preparation for the 2016 Olympics in Rio de Janeiro. Ready to go local fighters from left Stephan Gouveia, Eon Bancroft, Dennis Thomas and Imran Khan. Manager of the Trinidad and Tobago team Willie Williams stated that his fighters are well prepared for their engagements and are eager to do well. He also stated that the both countries will benefit since they are breaking the monotony of fighting among themselves. He also predicted victory for his fighters. Apart from the Amateur fights there will also be four Professional bouts. In the Amateur category Middleweight Dennis Thomas (GUY) will tackle Declan Calliste (T&T), Lightweight Stephon Gouveia (GUY) will clash with Michael Alexander (T &T) and Welterweight Eon Bancroft (GUY) will face off with Leon Nottingham (T&T). Meanwhile, Bantamweight David Gonsalves of the Twin Island Republic did not made the trip for his clash with local fighter Imran Khan. Abdool however stated that Khan will not be left out of the card for they are currently negotiating for his opponent. The main event of the evening promises to be an exciting contest between Iwan Azore and Mark Austin, the two will battle for the Welterweight title of Guyana in a twelve round affair. In the other bouts Kishawn Simon will face Patrick Boston in the Catchweight division which is expected to last for six rounds, while Gladwin Dorway will come up against Cassius Matthews in the Junior Welterweight class in another six round affair. The lone Featherweight fight on the card which is also a six round contest will see Richard Williamson and Rudolph Fraser matching gloves. 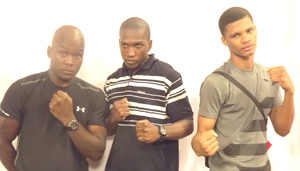 We are here the Trinidadians from left Matthew Alexander, Declan Calliste and Leon Nottingham. While the fighters from Trinidad and Tobago said they will do most of the talking in the ring, the locals were excited about the contest. Stephan Gouveia, who was on the receiving end when he fought Michael Alexander recently in Trinidad, said he will turn the tables around, “I wasn’t pleased with the result, I did well enough to win but they judges ruled in favour of Alexander. I will be victorious this time around.” Alexander in response said the decision was not his. Meanwhile, Welterweight fighter Matthews said he is well prepared for his fight and urged the public to support the card which is being sponsored by Digicel, Stag and NCN. Admission is $1,000.